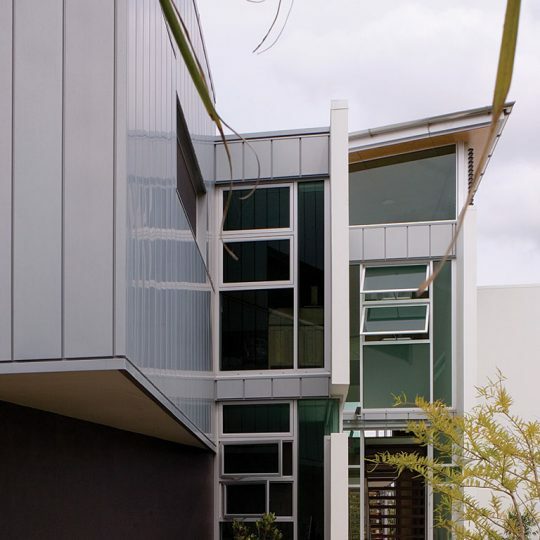 The 103 residence is located on the Brisbane Corso, Fairfield on a narrow site that fronts the Brisbane River. 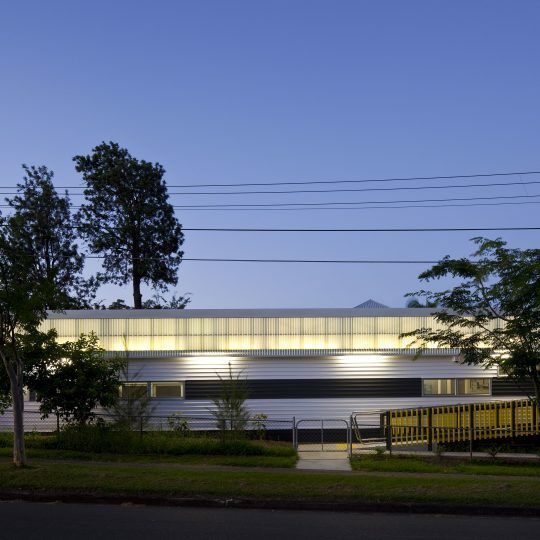 The river frontage of the site faces northwest and enjoys spectacular views to the north up the Dutton Park Cemetery reach of the river to Highgate Hill. The new Eleanor Schonell pedestrian/bus bridge is central to this view. In response to the above site conditions the wedge shaped plan of the house was established on a diagonal axis that extended from the street frontage through to the river boundary. The aim of this configuration was to reorientate the narrowly constrained site to the more desirable northern aspect and views beyond as well as provide rooms at the front of the site with views of the river. 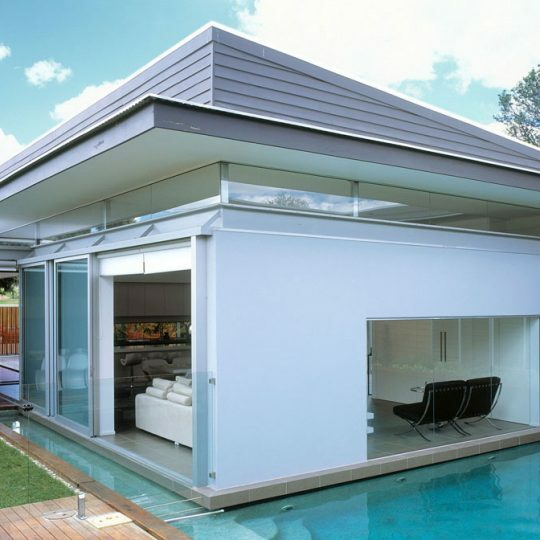 Spatially the house is divided into a number of zones which can be clearly interpreted in the buildings form. Service zones to both floors including bathrooms, kitchen and laundry are accommodated in a series of rendered block cells that extend along the southern boundary of the site forming the spine of the house. Banks of full height louvres set between each of these cells ensures natural light and ventilation to the house is maximised. 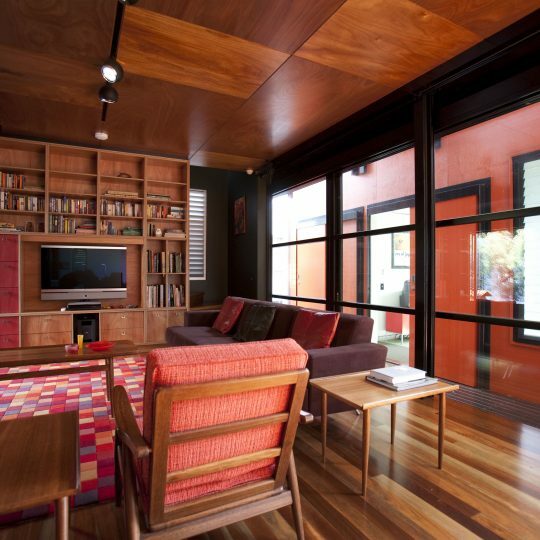 Internal and external living areas to both floors are focused toward the river. A high level wedge shaped roof floats lightly over the upper floor clerestory glazing opening these spaces up to the north. Extensive glazing ensures a strong connection with the river and views beyond. Sun is controlled by a series of external automated louvre blinds. The entry, bedrooms and study are located centrally with the house and are bounded by large block fin walls that reinforce the axial nature of the plan. These spaces enjoy views back to the front yard through full height glazing set between the fins.